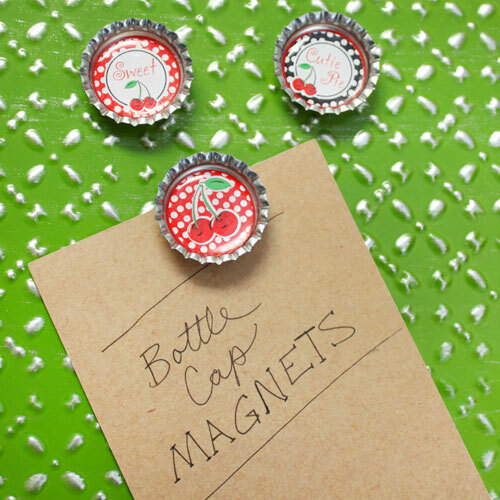 Here's a quick and simple diy bottle cap magnet tutorial. It's super fun! Plus magnets are perfect for fridges, family, friends and even fundraisers! What more could you ask for? STEP 1: Punch Your Images. 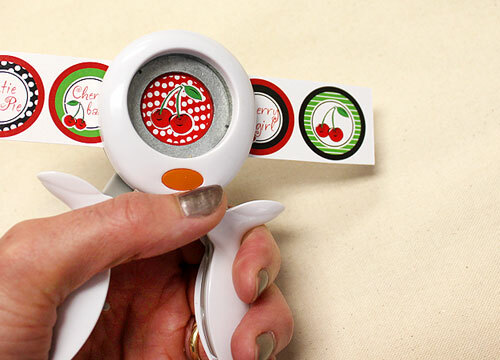 Use a 1" Circle Punch to cleanly punch out your bottle cap design. Use whatever design you wish. This is the fun part! Create your own design, use a photo, use scrap papers or bottle cap images. 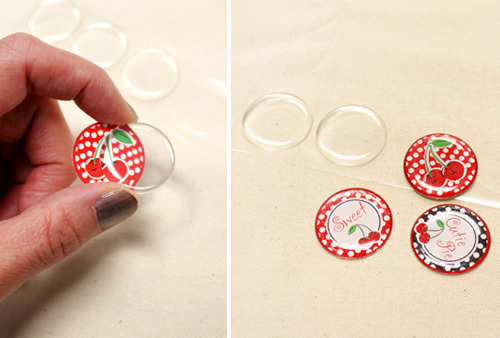 Adhere Epoxy Dots to bottle cap images. 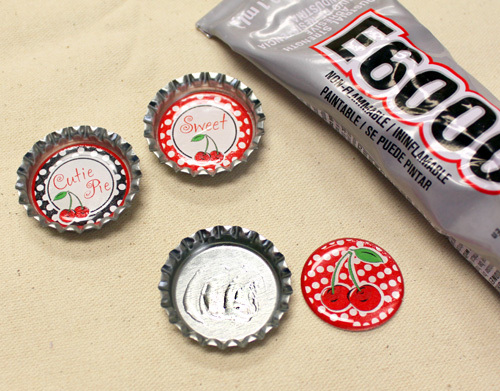 The epoxy dot is optional, but it will add a nice polish and shine to your bottle cap magnet. *The Epoxy Dot will protect your design, but it will not make it completely water proof. 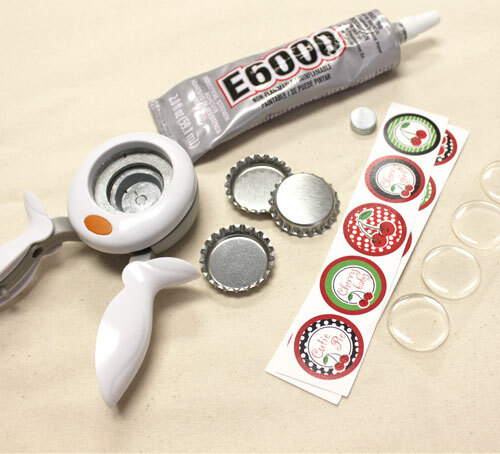 Use E6000 Glue to adhere your images to your bottle cap. Be careful not to use too much glue. If the E6000 spills over the top of the Epoxy Dot it will react to the Epoxy and sometimes do strange things to the design underneath the cap. Less is more when it comes to using E6000. While E6000 is an awesome industrial strength glue, and our glue of choice, you may want to try another adhesive if you're doing this fun craft project with children. 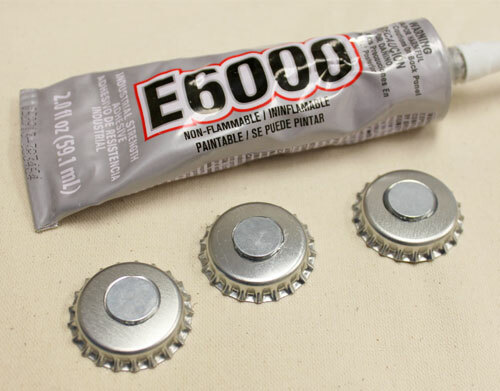 Use E6000 Glue to adhere your magnets to your bottle cap. Just a small dab will do. Just give your magnets about 20 minutes for the glue to dry and you're all set. Enjoy your beautiful new magnets on a fridge, locker, message board or give them to a friend and make some more for yourself. Have fun! Great idea - I make maagnets for local winery, but I flatten them and put design and epoxy circle on the other side - then magnet in back. Great for travelers as a small gift to bring home.